A powerhouse film loaded with great characters, massive amounts of conflict, and some really great performances. 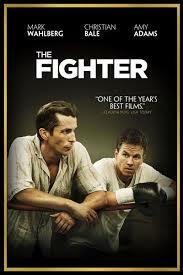 The Fighter might seem like a boxing movie, but instead of the sport, it is much more about the character’s dysfunctional family and life. The things that happen all around him, outside the ring, are ten times more interesting than anything that happens to him in it. That’s because this boxer, Mickey Ward, (Mark Wahlberg), is surrounded by colorful characters who all have an interest as well as the potential to cause him to screw up his future. 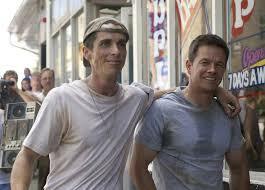 Christian Bale leads the pack, playing Walberg’s brother, Dicky Ward, “the pride of Lowell.” Dicky used to be a boxer too, but then he turned to crack and became a mess. Now he lives in a drug den with a bunch of strung out friends getting high and trying to escape from the world on a daily basis. The character might seem like the usual druggie, loser brother, but in the hands of Bale, he becomes something we haven’t quite ever seen before. Bale plays him as regretful. A guy, who knows better, yet keeps plodding along the same path. He has plenty of moments where he tries to be serious and understanding about the world, and for some reason these moments never work out for him. Dicky Ward has an impact on his brother’s life because he is the coach. He’s the guy in Mickey’s corner giving him little pep talks in between each round of a boxing match. He’s the guy that spars with and trains Mickey every step of the way. Only he doesn’t have the pull or connections to get Mickey what he needs and Mickey ends up getting hurt because of it. There’s a scene early on where the boxer he’s supposed to fight drops out and Mickey finds himself getting pounded by a replacement fighter who has twenty pounds on him. Dicky and his mother get the blame for putting Mickey in this situation. The mother, played wonderfully by Melissa Leo, is another one of these colorful characters. She’s nearly as bad as Dicky, completely crippling to Wahlberg, making him rely on his brother instead of doing what’s best for his own career. Part of it is the mother likes the older son best syndrome, kind of like Ordinary People. And part of it is because the mother has to blame herself for the way Dicky turned out and feels like she owes it to him to get him every advantage she can, even if it means sacrificing her other son. The mom insists that Wahlberg stay with Dicky, claiming that nobody’s going to care for Wahlberg as much as family does. That might be true, but caring can only get you so far. That’s what Amy Adams, who plays Wahlberg’s girlfriend, keeps telling him. Dickey and the mom are no good and they’re hurting Wahlberg’s career. Adams plays the third of these fantastic characters, and she goes head to head against the mother in a number of scenes. She’s also got a whole slew of Wahlberg’s sisters to defend herself against. The sister’s hate her from the start for being prettier and more educated than any of them, but once the battle ensues between Adams and the mom, their hatred suddenly becomes fueled by a cause. Wahlberg is caught in the middle of all of this. He’s a quiet, calm guy and the last thing he wants to do is throw anybody away. But the driving forces pulling at him from both sides are so strong, that it seems like making a decision one way or another will be inevitable. All he needs is the smallest factor to tip the scale in the direction of one way or the other. He gets that factor in the father who comes in strong supporting one of the sides. This is a completely fascinating movie. It is a character study and a family conflict film. Boxing takes a back seat to everything going on between the characters, and that’s a good thing, because the boxing scenes really are just okay. I’ve seen plenty of boxing movies that do it better, from Raging Bull to Rocky, but this movie has something else going for it. It has characters that jump off the screen and conflict that hides around every corner. Amy Adams, Melissa Leo, and Christian Bale all received Oscar nominations and every one of them was well deserved. The three of them completely drive this movie with their ongoing game of tug of war. But what makes the movie great is not just the conflict. It’s also the way things turn out. The characters that make decisions don’t always do the right thing or the smart thing and that’s pretty realistic. They know what the smart thing is, but their feelings are too strong to just pretend these are simple no-brainer decisions, as much as they seem like they might be. The Boxer is a smart movie that examines characters in crisis and how they rely on each other for answers. There’s a whole segment of the movie devoted to the airing of a documentary about Dicky and how his life went down the toilet when he turned to crack, and watching the characters sit around viewing the show, and their reactions. It’s pretty gripping stuff. They call each other and talk about what are happening and what it means, and just listening to how hurt they are is incredibly powerful and emotional. Dicky watches from prison and what starts out as a celebration of fame turns into an unexpected disaster. The movie is a character study driven by fantastic performances. It’s a movie about a family that has secrets and problems, some of them on the surface, others hidden down so far they refuse to acknowledge them. The boxing scenes aren’t bad, but they are nothing compared to the character conflicts. These boxing moments happen to be the worst thing about the film, only because they are not as riveting as the rest of it. The movie is powerful and interesting and is definitely the film with more great performances in it then any other movie that came out this year.